In an inclusive early childhood setting, how can you modify your teaching strategies and everyday activities so that all children can participate? Today’s post gives you some answers, with a special focus on including young learners with physical and sensory impairments. 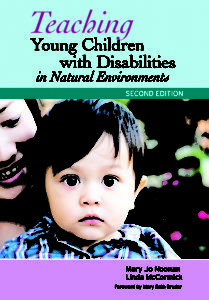 Excerpted and adapted from the book Teaching Young Children with Disabilities in Natural Environments, Second Edition, by Mary Jo Noonan & Linda McCormick, these simple modification strategies will help you create an early childhood classroom where every child has access to daily activities and learning experiences. Seat the child in front of the speaker in circle activities: Placing the child near the speaker maximizes hearing and helps the child read speech and see facial expressions. Speak in a normal teaching voice: Don’t speak louder than you normally would. Instead, use natural gestures and visuals such as photos, symbols, and objects to supplement your oral presentations. Speak the child’s name when addressing them: Wait until the child is looking at you before speaking. Indicate what you’re referring to: When you’re referring to someone or something in the classroom environment, touch, point, or nod in the direction of the referent. Don’t stand in front of a strong light source when speaking to the child: The child will miss important visual cues when your face is in the dark. Teach peers attention-getting techniques and remind them to speak one at a time and to look at the child when addressing them. Even preschoolers learn very quickly to touch the student lightly on the shoulder and look them in the face while talking. Learn and use as many signs as possible: If the child signs, learn and use functional signs such as “all finished,” “sit,” and “toilet.” Encourage peers without disabilities to use them, too. Provide physical cues about how to carry out a task or activity. For example, gently guide the child to the housekeeping center. Place one of their hands on a bowl and put a spoon in the other hand. Encourage exploration and manipulation of all parts of an object. It’s important for the child to understand the relationship of the parts of the object to the whole. Ensure optimal positioning for all activities. Optimal positioning allows the child to relax, feel safe and secure, focus attention on the activity, and have sufficient controlled movement for independent functioning. If you have students who use wheelchairs, rethink the positioning of your other students, too—for example, have your class sit in chairs during circle time rather than on the floor so that everyone is at eye level with a child who uses a wheelchair. Incorporate easy-to-use materials. In your play centers, include items that are large and easy to grasp and manipulate. Smaller items can be substituted as children with fine motor limitations become more proficient. Make adapted materials for students who need them. Many items such as adapted scissors, adapted puzzles, and adapted eating utensils and cups are easy to make using standard materials like Velcro, glue, and tape. Building up a spoon or fork handle with layers of tape may ease grasping so a child can feed herself. Velcro straps added to a musical instrument allow a child with an unsteady grasp to shake a tambourine just like his peers without disabilities. Keep material and equipment modifications and adaptations as simple as possible. The idea is to change and modify only to the extent absolutely necessary to accomplish the desired purpose. Make sure procedures and planned experiences are as similar as possible to those of peers without disabilities. The rule is that the less intrusive the strategy, the higher preference it should be given. Avoid experiences that differ from those provided to peers without disabilities, interfere with daily routines, call undue attention to the child, or promote dependence. When alternative activity arrangements are necessary, the modifications should be as rich and varied as activities provided to peers without disabilities. Collaborate with other team members. Physical and occupational therapists and parents can help with more ideas for adapting equipment and modifying materials for young children with physical impairments. 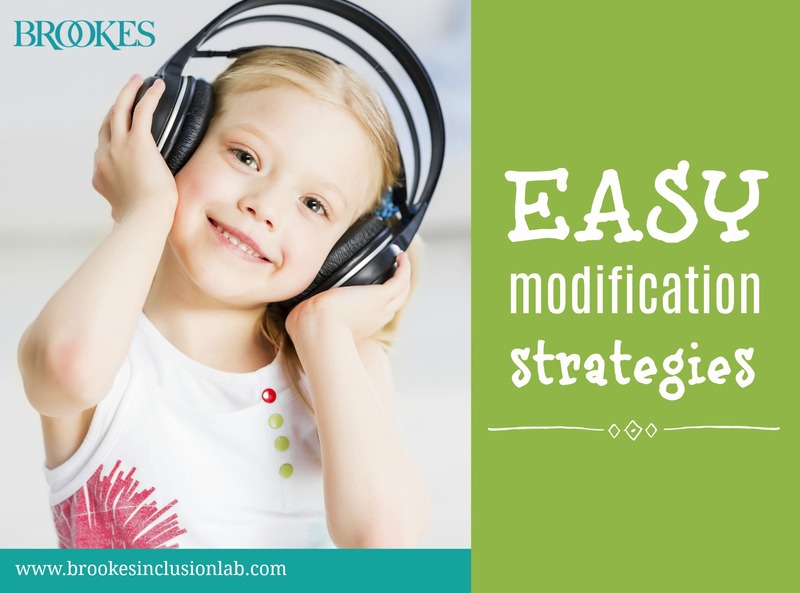 Share these modification ideas with your team, or with colleagues who work in inclusive early childhood settings. And if you liked this excerpt and want more ideas on teaching young children with disabilities, check out the book! Portions of the limited motor abilities section adapted from Sheldon, K. (1996). “Can I play too?” Adapting common classroom activities for children with limited motor abilities. Early Childhood Education Journal, 11, 115–120.